Apple has released a standalone removal tool that targets Flashback malware infections. 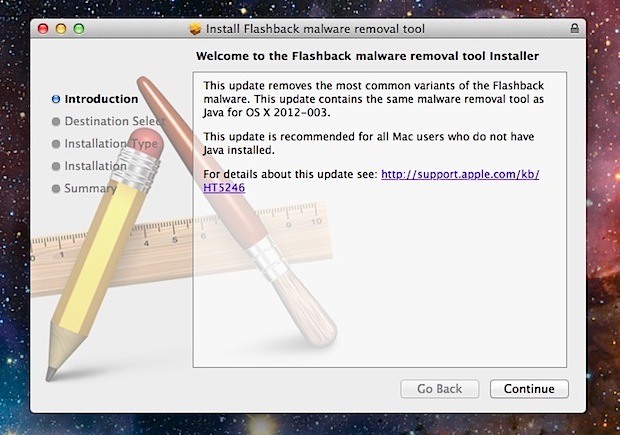 The separate utility is recommended for Mac users who do not have Java installed on their OS X Lion machine, but it’s functionality is identical to that performed by the most recent Java update to remove Flashback. Everything beyond that is automated, if the Mac is infected it will be automatically repaired. Users should always keep system software up to date as part of a general maintenance routine. Despite the recent media overhyping of Flashback, Mac OS X remains a very secure platform. If you are concerned about potential attacks, our recent guide on securing Mac OS X from potential trojans and malware may be helpful to you.